First OppCharge e-bus chargers to be deployed in Poland - Ekoenergetyka-Polska Sp. z o.o. 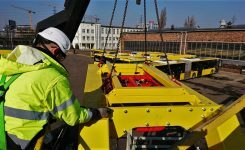 The chargers, by Polish manufacturer Ekoenergetyka, will be deployed for the first time in the city of Inowrocław. The 300 kW devices, equipped with top-down pantograph, will be delivered this fall to power city’s new Volvo e-buses. This is the second bus electrification project for Inowrocław: the opportunity chargers will join Ekoenergetyka’s depot charger that the city obtained in 2015. 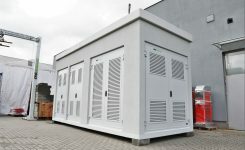 The 300 kW opportunity charger from Ekoenergetyka will be used to charge 8 Volvo buses. 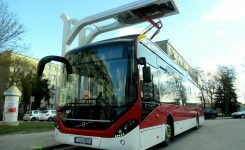 Thanks to the automatic charging with top-down pantographs, Inowrocław’s e-buses will receive quick energy top-ups during the day while they stop at bus termini, with no disruption to their schedule nor to driver’s current responsibilities. The devices will be located across the city and will be used for no more than 8 min per charging sessions between two routes couple of times per day. In addition to the chargers Ekoenergetyka will provide an external monitoring system that will enable the bus operator to check in real-time the charging processes of its vehicles, gather data about the charging-related process and perform maintenance. Charging infrastructure will follow international protocol ISO 15118 which defines communication between the chargers and the electric buses as well as the industry-supported OppCharge system for top-down charging. This will ensure the interoperability of the charging system with all buses compliant with those international standards and charging protocols.